"The 1811 mass killings in the East End of London, the Ratcliffe Highway Murders, and their effect on an excitable population"
"attracted the attention of opium junkie and writer Thomas de Quincey, who wrote a borderline satirical essay on the slaughter." 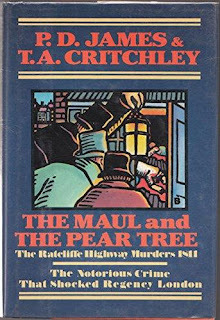 After sitting there glued to the screen, I realized that I actually owned an old hardcover copy of The Maul and The Pear Tree, so it shot up to the top of my TBR pile, along with Thomas de Quincey's On Murder As Considered as One of the Fine Arts. Both are excellent reads, although de Quincey's lecture can be a bit daunting to get through. 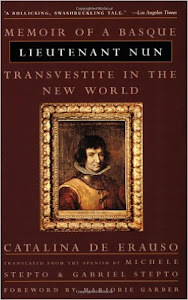 Having said that, it is still well worth reading. "Murder! Murder! Come and see what murder is here!" to the small crowd which had started to gather. The body of Timothy Marr was then discovered, leaving only the three-month old baby Timothy Junior unaccounted for; sadly his body too was found laying in its cradle, after having been killed in a most brutal manner. While government, the magistrates, and the public were still reeling from these events, full-fledged panic set in just twelve days later when another gruesome set of murders occurred, this time at the nearby pub in Gravel Lane called The King's Arms. "People were shouting and running, and above the din, repeated again and again, came the terrible cry, 'Murder! Murder!' "
"A man, nearly naked, was suspended in mid-air, clutching sheets knotted together. Hand over hand he was making his way down from an open garret window, shrieking and crying incoherently." 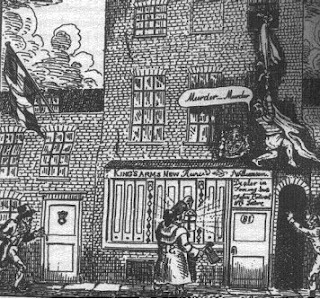 The man was John Turner, the lodger, whose cries of "Murder" led to members of the crowd breaking into the King's Arms, where they discovered the bodies of proprietor John Williamson, his wife Elizabeth, and the servant woman Bridget Harrison. Once again, the deaths had been extremely violent; unlike the Marr murders though, the perpetrators had spared one victim, the Williamsons' young granddaughter. James and Critchley use these two murders to examine not only those particular cases, but also to shed light on the state of policing at the time (no unified London police force to speak of); the haphazard questioning and arrests of several people by the powers that be who were supposed to be in charge, namely the very disorganized Thames River Police, constables who went unpaid, magistrates who too often just didn't care, a government that often looked the other way, and the local parish watchmen. Much time is devoted to the xenophobic outlook that made it easy to accuse "foreigners" of any crimes. They also look at the effect of the widespread (read nationwide) panic brought about by these two horrific murders, and then, of course, at the arrest of the "guilty" party, John Williams, based on nothing but circumstantial evidence and hearsay testimony. There were a few responsible parties who actually asked the right questions about other suspects, but they were largely ignored after Williams' arrest and subsequent suicide in his jail cell, which seemed to offer some sort of proof that he was indeed the guilty party. And finally, the two authors examine the question of Williams' actual guilt, offering conflicting evidence pointing away from him and toward someone else. "made his debut on the stage of Ratcliffe Highway and executed those unparalleled murders which have procured for him such a brilliant and undying reputation." De Quincey defines murder as an "artform," actually referring to the Ratcliffe Highway murders in a rather satirical fashion as "performance," and also discusses the role of the press in sharing these "performances" with the public over breakfast; over the four essays he makes the case for murder as a sort of public "cause de celebration" in which people want to be involved. As Judith Flanders notes in her The Invention of Murder, in elevating Williams to center stage as an artist who has "carried his art to a point of colossal sublimity,"
As anyone who's read any sort of later nineteenth-century Victorian sensation fiction or Victorian crime fiction knows, that idea resonates clearly through much of that sort of literature of the time, and actually continues to this day. 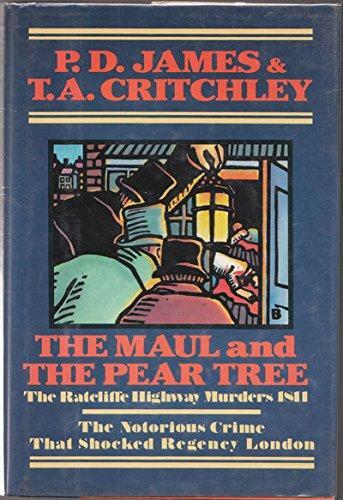 The Maul and the Pear Tree, as I said, is a great read, an excellent study of not simply two crimes, but James' and Critchley's in-depth research turns this book into a broader social and cultural history of the time. If you ask me, that's the way every true crime account should be handled. And while De Quincey may be most challenging to read, Frances Wilson's book Guilty Thing: A Life of Thomas De Quincey sets these four essays in context, making them a bit more doable. Anyone with even the slightest interest in British historical true crime shouldn't miss The Maul and the Pear Tree. And don't miss A Very British Murder with Lucy Worsley! I hate the way she says the word "muhduh" but it's a great series.